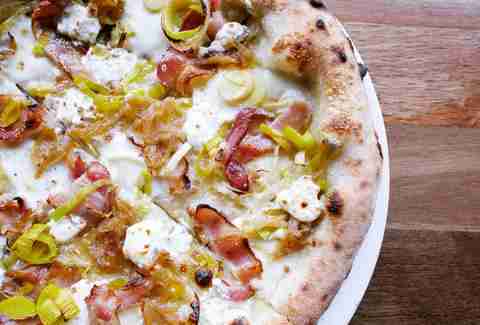 L ucky for us Portland is awash in great pizza places these days, from late-night joints serving up greasy New York-style slices to handcrafted, wood-fired Italian-style pizza topped with local charcuterie, and/or weird toppings like Chinese BBQ pork or faux meatballs. 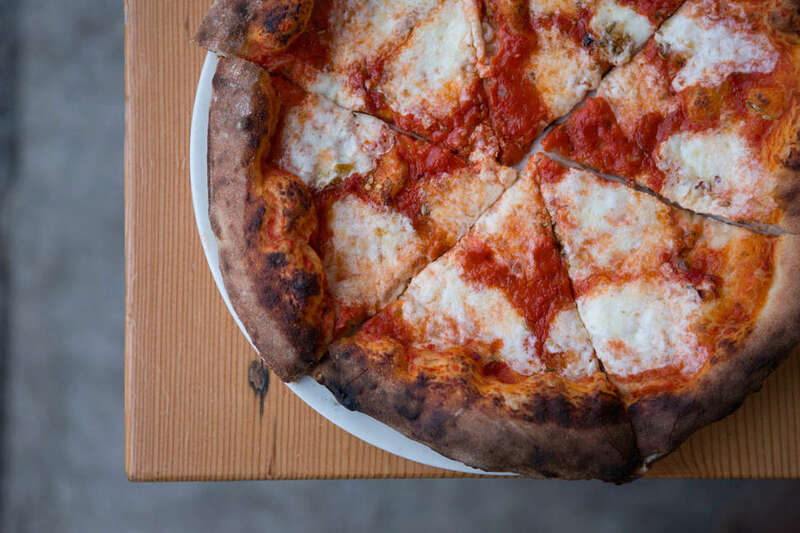 Portland chefs and restaurateurs have delved deep into what the ingenious concoction of baked dough with tomato and cheese on top can offer, and we’re all the better for it. 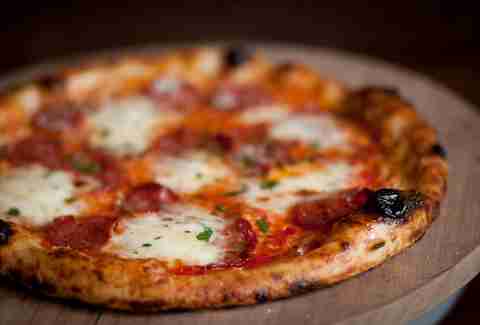 Here are our picks of the best pizzerias in Bridge City. 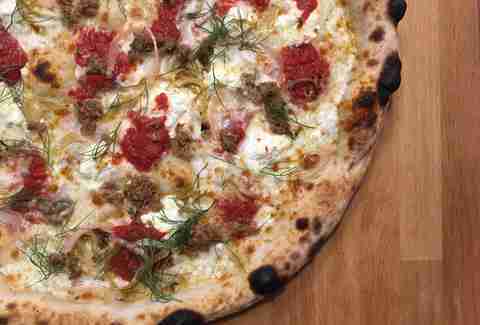 A relative newcomer to the wood-fired pizza craze that has gripped Portland, Life of Pie has quickly become a mainstay thanks to a crust that is perfectly charred, but still chewy, and always topped with fresh, seasonal ingredients. Or maybe because of their seven hour happy hour. Neapolitan pizza from six-time James Beard Award finalist Cathy Whims sounds fussy, but there’s nothing overwrought about the rustic combinations she dreams up to complement her beautiful crust. Just don’t expect to get it sliced. That’s not how they do it in Naples. 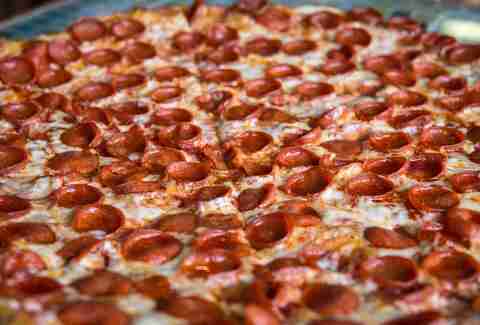 Open late with multiple locations, Sizzle Pie is Portland’s favorite punk rock pizza place. The floppy, thin-crust pizza slices are authentically New York (they even have a location in Brooklyn now), and you can always find a pepperoni, meat special, vegetarian, and even vegan option by the slice every night. Best, all locations are open until 3 or 4am, depending on the day of the week, and serve beer and wine until just after 2am, if you want to keep the party going. Lovely’s Fifty-Fifty is a decidedly Northwest style pizza restaurant. 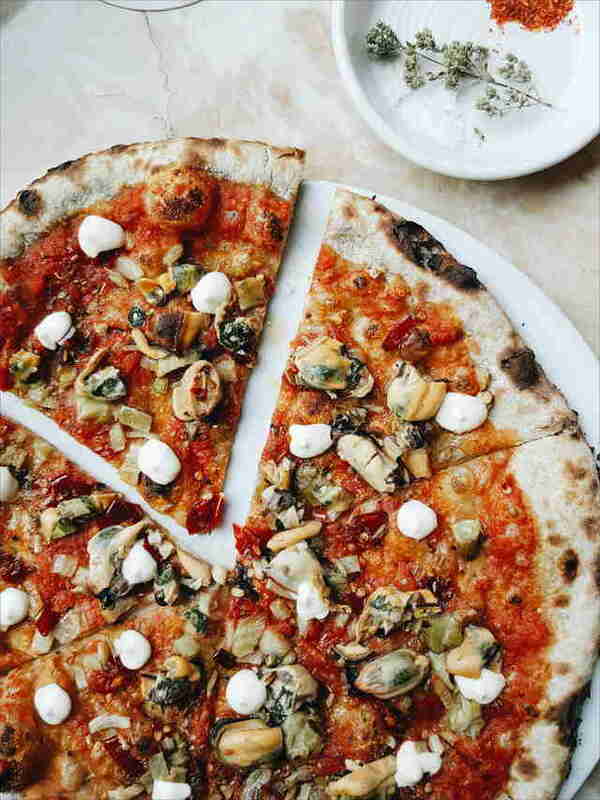 This ostensibly means they incorporate rich homemade tomato sauces using local ingredients, and an array of toppings that might be frowned at in a New York pizza shop, but reflect the seasonality of Portland cuisine. Think squash and ricotta with brown butter in fall, nettles in spring, and locally harvested chanterelles to mark the end of summer. While it’s tempting to stick to classics like the great margherita, Lovely’s Fifty-Fifty really shines when it plays with local flavors and unexpected combinations. We’re assuredly going to get some flak for this. 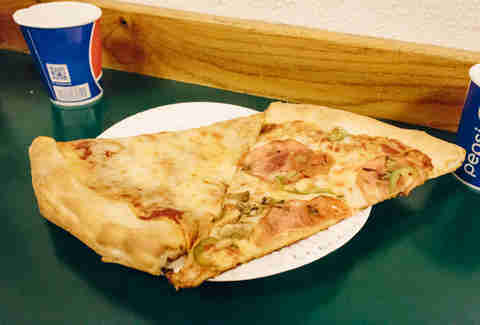 Some might say that Straight from New York or Atlas Pizza have more authentic New York-style slices. Some might also (fairly) argue that Sizzle Pie is the best. Others would likely throw any of our pizzas on the ground and declare them unfit by the rigorous NYC standards. But Escape From New York has been serving its reheated slices of pepperoni and cheese pizzas out of its narrow, dingy space since 1983 to an unending audience, and for that, we’ve gotta give it up. The line outside of Apizza Scholls has become as iconic as the pies themselves. Unlike certain other spots in the city that boast a long waiting period, Apizza Scholls is worth it, featuring handcrafted, thin-crust pizza with only the essential toppings. There’s no calling ahead, they have a limit on ingredients for custom pizzas (and no substitutions or omissions on the house ones), and when they run out of dough, you run out of luck. But the pizzas coming out of the electric ovens aren’t just some of the best in the city, but some of the best in the country. 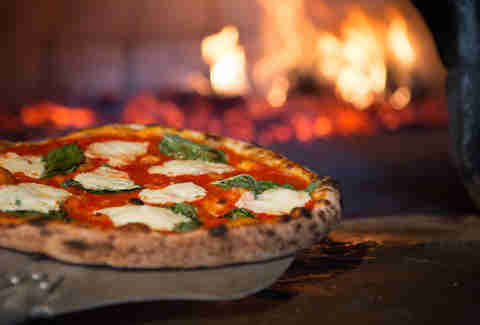 Ken Forkish’s eponymous pizza place has long led the city’s trend of wood oven, thin-crust Neapolitan style pizzas. The pies are simple, with dollops of fresh mozzarella resting in the tangy tomato sauce, with just a few toppings each. Whether you’re getting it with olives, peppers, or soppressata, it’s highly recommended -- even required -- that you add a pile of fresh, bitter arugula on top. Grab a glass of wine or a Negroni for the full “I wish I could be on the Italian coast but I’m broke so this works” experience. 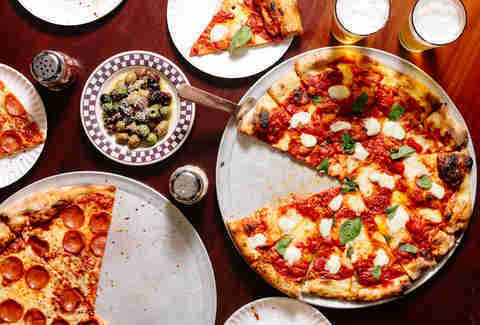 A New York-style pizza topped with Tommy Habetz’s (Bunk Sandwiches) indulgent toppings, Pizza Jerk has become a mainstay in Portland’s food and drink industry culture, as well as the city at large. While you can always find a slice of cheese or pepperoni, you can also find pizzas topped with char siu and pineapple, ribs, and even chicken Parmigiana. It’s over the top, it’s extravagant, and it’s necessary & delicious. One of the original ChefStable projects, Oven & Shaker is a collaboration between expert pizza chef Cathy Whims of Nostrana (a fantastic pizza joint in its own right) and venerable bartender Ryan Magarian. Today it continues to deliver on the promise it started with back in 2011: excellent craft cocktails paired with delicious wood-fired oven pizza in a casual, saloon-style atmosphere. While the Mississippi neighborhood is best known for its bars and venues, Mississippi Pizza is a great place for all ages. The pizza isn’t the absolute best in Portland, but it’s a totally solid option for the neighborhood and available gluten-free. The space, however, is a welcoming, family-friendly restaurant that also serves as occasional music venue for local and touring acts. So catch a show, feed the kids, have a beer, and kick back. Renata is mostly lauded for its incredible pasta selection, cocktails, and well-curated wine list, but its pizzas should not be missed. This is especially true during happy hour, which runs both early and late, only on the patio and in the bar. Then you can find margheritas, blancos, and other pizzas for just $6 to $7, and they’re the perfect size to split for an appetizer, paired with one of the great wines on the menu. You’ll want to go ahead and add some Calabrian chilis and arugula for just a few bucks more. Hotlips specializes in local, organic ingredients on Portland-style pizza. PSU students have ample options for lunch in the food cart pods around campus, but Hotlips offers the best pizza choice, with student specials and happy hours. And while it does offer up some beer and wine, you can also snag homemade organic fruit sodas. New on the pizza scene, Virtuous Pizza is nobly battling the inherent idea that a pizza must have, at the very least, cheese to be considered such. Or, more simply, it champions that idea that pizza cannot only be vegan, but can actually be vegan and good. Cashew nut cheeses, vegetarian meatballs, Buffalo cauliflower, etc... it’s all vegan, and all pleasing. You can even order any pizza gluten-free, for your pickiest, most Portlandish friends. Or, take your most carnivorous friend and watch them fall in love with it. East Glisan resembles a classic Portland pizzeria in that it’s a casual, laid-back bar that happens to have excellently prepared, wood-fired licked pizzas. It boasts a selection of vegan options, including pizza, but also sides (like the delightful chickpea fritters), as well as a great tap list of rotating beers. 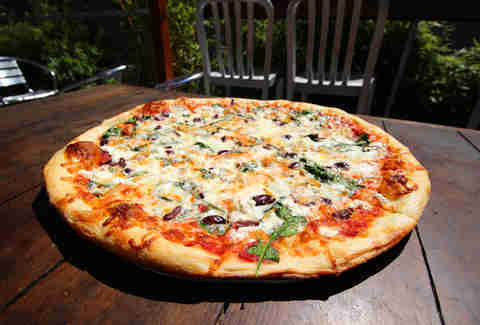 Get in here during happy hour, 4 to 6pm for $2 slices, or come after 10pm for extra-large cheese slices for just a buck. Renovating an uninspiring deli into a late night pizza bar was a brilliant move on the part of Vitaly Paley and Co. 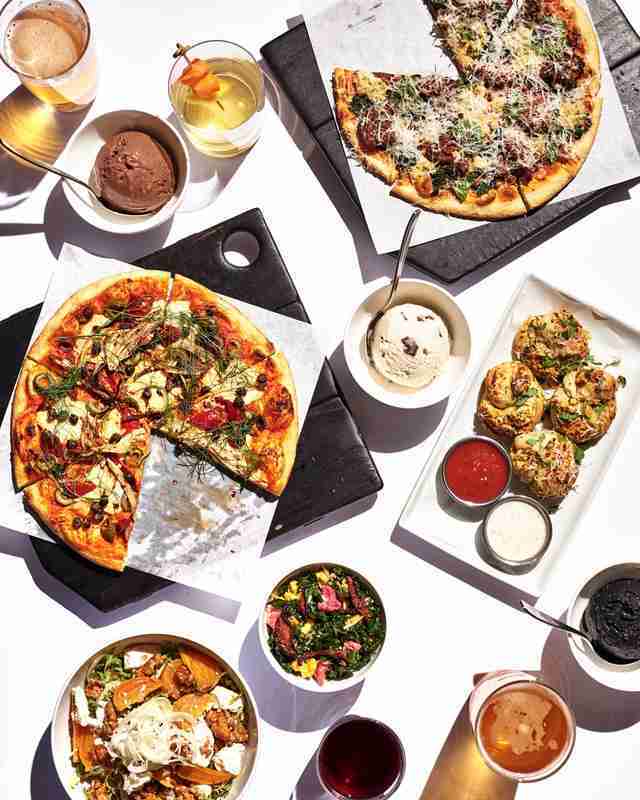 The Crown, which replaced Penny Diner in the summer of 2017, is a welcome addition to the late-night Downtown scene, providing revelers a spot to grab a slice of pizza or full pie, along with some great cocktails, beer, and wine. Most of the pies reflect Paley’s time living in New York, though the fried chicken with ranch, pickles, and chili honey is a surprising, unconventional treat. Don’t worry, Scottie Rivera of Scottie’s Pizza is from Brooklyn, so you know he knows what makes a good pie. And while he does, indeed, bake some great pizza, it’s his and his wife/business partner Amy Coplen’s labor ethos that sets the spot apart from the rest of the city’s pizza joints, as they pay their workers a living wage of $15 an hour. You can also pay it forward and help someone else out with a slice. Swing by during happy hour for $2 plain slices, or on the first Friday of the month after 10pm, when they make giant, 28-inch pies with huge slices for $5 each. Oh, and in spring of 2017 they set a world record by baking a 100-cheese pizza. It’s an arduous task sampling what the best pizzas in Portland are, but Alex Frane is willing to do the dirty work. Follow his progress at @franiacdrinks.